Today I picked up a copy of Moleskin Maps: Volume 1 by Chubby Monster Games. I’ve been following Matt Jackson’s work for awhile, and when I saw the free preview of one of the maps in the book, I was sold – especially given the $1.99 price tag. The PDF includes 11 maps. Each map has two pages. One page is full page rendering of the map. The other page is a helpful worksheet with a 1⁄4 size image of the map and space to write down the Location Name, Background, Key Locations, GM Notes, Wandering Encounters, and Major Treasure. The mapped regions are small and digestible; With enough space to flesh out an interesting monster lair. If you are going to make your first dungeon, starting with one of these maps – don’t forget free preview – would be a great idea. The concept of the project is simple, the execution is fabulous. With the crisply inked maps and the “fill your own micro dungeon” mindset, Moleskin Maps is a fantastic addition to my gaming arsenal. 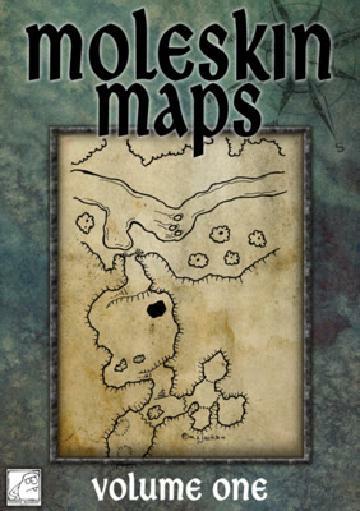 Moleskin Maps: Volume 1 by Chubby Monster Games by Jeremy Friesen is licensed under a Creative Commons Attribution-NonCommercial-NoDerivatives 4.0 International License. Based on a work at https://takeonrules.com/2012/09/19/moleskin-maps-volume-1-by-chubby-monster-games/. Permissions beyond the scope of this license may be available at https://takeonrules.com/more_permissions/.